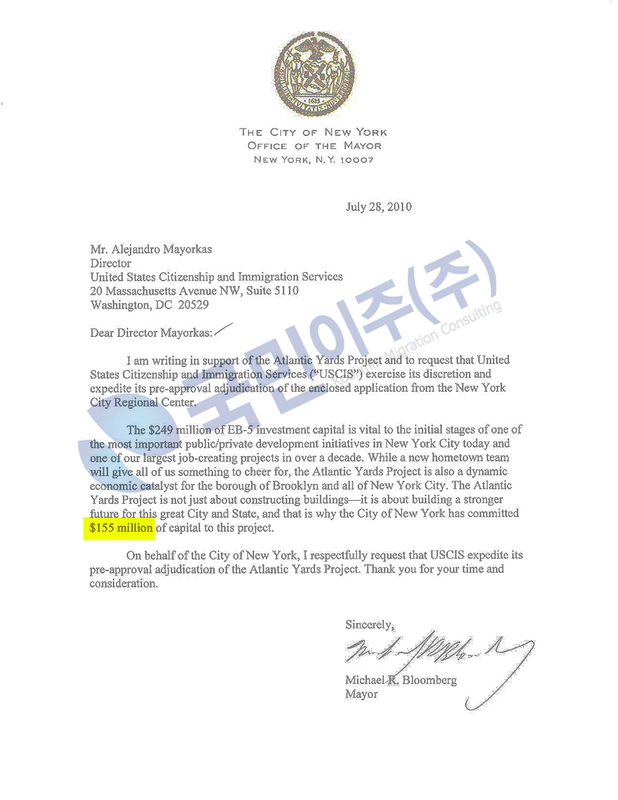 So, how exactly did Forest City Ratner and the New York City Regional Center (NYCRC) aim to convince federal overseers and potential investors that the plan to seek $249 million in funds from 498 green card-seeking immigrant investors was kosher? We may never know, since the federal agency overseeing the EB-5 program is keeping most key information under wraps. For example, the document explaining how that investment would produce--as required by federal law--at least ten jobs per $500,000 investor was redacted, deemed a trade secret. 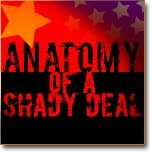 Other documents deemed trade secrets have already been made public by other parties, suggesting that the United States Citizenship and Immigration Services (USCIS) has a rather heavy hand when it comes to transparency. So, while the EB-5 program is justified as supporting job creation, there's no way to evaluate that claim when it comes to the Brooklyn Arena & Infrastructure Project--said to consist of the arena, infrastructure, and a new railyard--marketed to immigrant investors. And that's quite curious because the arena was and remains already funded. That makes it questionable that immigrant investors could get credit for jobs created not merely by their investment but by the entire $1.448 billion project, a project that did not need their money to proceed. That suggests that the job count in the EB-5 program, at least in the Atlantic Yards example, relies more on accounting tricks than actual new jobs created. And that suggests that the program does far less for the public good than for developer Forest City Ratner, which likely saves well over $100 million over conventional financing. 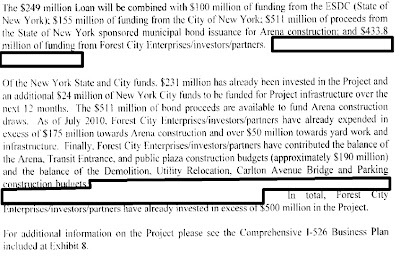 Still, the pages left unredacted show the NYCRC claiming, not so credibly, that the goal of the EB-5 project was to ensure tax revenues to the city and state, and even claiming, misleadingly, that the arena bonds are municipal bonds. 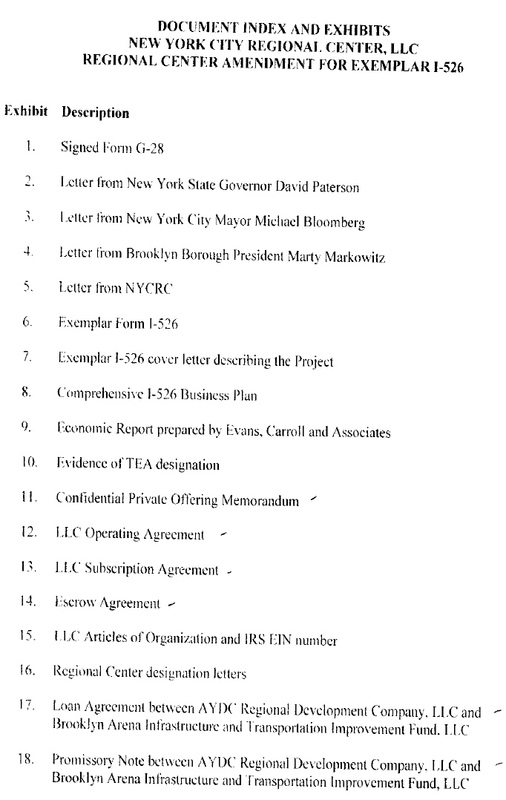 In September 2010, I filed a Freedom of Information Act (FOIA) request with the USCIS to get the business plan, the economic report, and other documents behind the Brooklyn Arena & Infrastructure Project. The NYCRC solicited $500,000 (plus a $38,000 fee ) from each of 498 investors, mostly from China. The law firm representing each investor would earn $14,750. The investors would get green cards for themselves and their families. 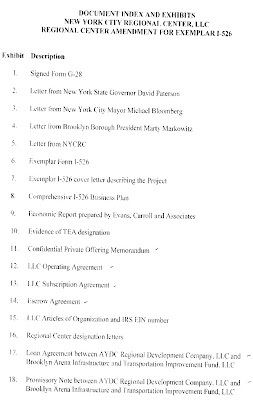 The NYCRC, the federally authorized private investment pool marketing the project, claims that the entire project is subscribed. It's not clear if the money--a low-interest loan to Forest City --has been transferred. As I explained last March, most of my request was stonewalled and delayed, but I was told one request was granted. This week, I finally got a response (below): 721 pages responsive to my request, but with 492 of them withheld and 20 more withheld in part. So nearly all the interesting documents at left (p. 432 of the file) was withheld. The justification? "Exemption (b)(4) protects trade secrets and commercial or financial information that is privileged or confidential." EB-5 funding is critical to ensure that the development is completed on schedule, creating jobs and tax revenues that the State and City of New York desperately need in this deep economic recession. But it's curious that the justification was jobs and tax revenues, since Forest City would have to provide the jobs and tax revenues anyway. The more likely justification: savings for the developer and fees for the NYCRC and the lawyers working the transaction. Those requesting expedited adjudication were Gov. David Paterson, Mayor Mike Bloomberg, and Brooklyn Borough President Marty Markowitz, so presumably they endorsed that sentiment. But their letters were redacted. 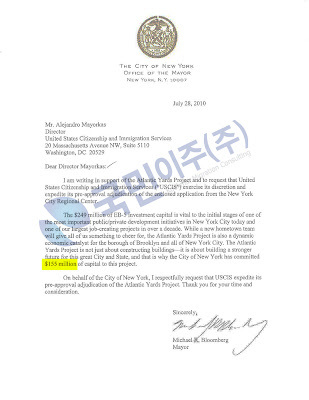 Curiously enough, the NYCRC's South Korean affiliate saw no problem in posting Bloomberg's boosterish letter (right), in an attempt to recruit investors. The Atlantic Yards Project is situated adjacent to the very site where the Brooklyn Dodgers proposed to build a major league baseball stadium over 50 years ago when Brooklyn proudly had its own professional sports team. Since the team left in 1957, the borough has yet to restore that remarkable and unmatched hometown nostalgia, enthusiasm, and pride. The Atlantic Yards Project will finally do that and more. Not only will the Atlantic Yards Project provide a state-of-the-art, multi-purpose sports arena needed to bring a professional sports team back to Brooklyn, it will also provide critical infrastructure work necessary to allow for the construction and operation of the arena and, over the course of the next decade, the construction of thousands of affordable and market-rate housing units. The $249 million loan will be combined with $100 million of funding from the ESDC (State of New York); $155 million of funding from the City of New York; $511 million of proceeds from the State of New York sponsored municipal bond issuance for Arena construction; and $433.8 million of funding from Forest City Enterprises/investors/partners. There are two things strange about that. 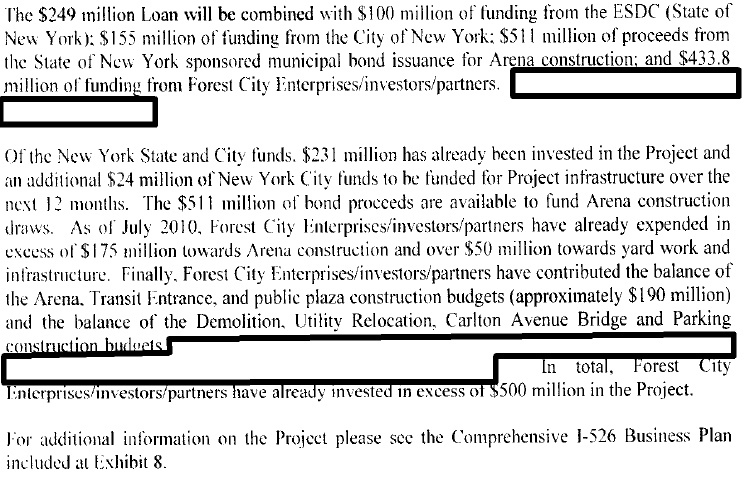 For one, the next paragraph, as indicated in the screenshot at right, states that Forest City and its investors/partners have invested more than $500 million, not $433.8 million. More importantly, the arena bonds are not municipal bonds. As explained in the 12/16/09 offering statement produced by Goldman, Sachs, the bonds are to be repaid by arena revenues via PILOTs (payments in lieu of taxes). No government agency is responsible for the bonds. So, how does the investment create at least ten jobs per investor? The feds won't let that trade secret out. The economic impact of the Project has been measured by Evans, Carol and Associates ("ECA"), a leading EB-5 economic firm which to date has received USCIS approval for 23 submitted regional center economic reports. ECA utilized RIMS II final demand multipliers to determine that the construction activity for the Project and operation of the Arena will create a [redacted]. The economic report, Exhibit 9, was also redacted. Scroll down to page 715 of the file and see some pages that seem odd as part of the package. They include part of a Wikipedia entry on Atlantic Yards, an article I wrote on Jane Jacobs's response to Atlantic Yards, a page from a blog post on the New York Times's tough coverage of a stadium deal in New Jersey, and part of a Wikipedia entry on PILOTs (payments in lieu of taxes).